Celebrity culture, or rather the cult of the celebrity, is hardly a new thing. People wanting to touch the hem of Jesus’ cloth is maybe the first known instance of how close we come to such adulation. Nowadays, celebrities are simultaneously so much nearer and so much further aloof. It’s not so much about touching the hem of their cloth, but knowing someone who has touched the hem of the cloth. Or knowing their brother’s best friend who has. If, as Momus says, “everybody is famous for 15 people”, surely we can all draw a diagram laying bare our contingent relationship with a celebrity, rather like a child’s maze puzzle where you are A and the celebrity is B. 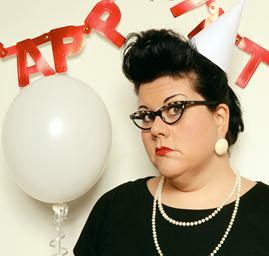 Such is the premise of Amy Lamé’s Unhappy Birthday show. A self-confessed Morrissey and Smiths fanatic, this New Jersey devotee uprooted herself from her homeland just to be in the same country as her idol. That’s a long way from A to B near a celebrity. Teaming up with former Melody Maker snapper Tom Sheehan, responsible for many iconic pictures of the quiffed one, Lamé takes you on a tour of her personal obsession and brief yet dizzying encounters with the Moz. The show is split into 14 scenes which are each signified by a Smiths or Morrissey song, with audience participation being the glue holding it together. We are all given party hats and poppers as we enter, and as befits a birthday party there are several rounds of pass the parcel. Not your usual present inside but more often a signifier for Amy to recount a personal Morrissey misadventure. The show’s pace is frenetic and highly physical. Lamé manically cuts away at her own hair during Hairdresser on Fire and proceeds to douse herself with hair spray as if it were deodorant; the audience is invited to guess the weight of her birthday cake which she then proceeds to devour by sticking her face into the middle of it and smearing around her face. There are slapstick routines and knockabout tussles with the audience (I was grateful for being relatively hidden in my seat) and there is no denying the anarchic spirit of the show. At one stage, Lamé dons a priest’s cassock and we all rise to say the ‘Moz Blessing’ before joining in with a collective hymn, in this case This Charming Man. There was more than one ageing quiff in the audience and plenty of people wearing T-shirts signifying their allegiance to the band and the man as fervently as any City fan would. So it was surprising that Lamé didn’t invite this Mancunian audience to spill the beans on their own Morrissey obsessions and encounters. Not only were we in his home town but just yards away from the Holy Name Church so memorably mentioned in Vicar in a Tutu. This is my only caveat from a show that would see Morrissey himself oscillate wildly. Lamé is carrying on a fine tradition of fandom which beginnings in the bedroom and – in this case – ends on the stage.